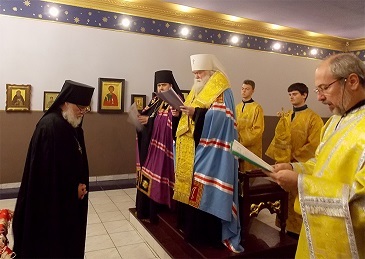 According to the Decree of the Council of Bishops, on October 30th, at the Sunday Divine Liturgy, Metropolitan Agafangel and Archbishop George ordained Abbot John (Smelic) to the rank of bishop. Before the ordination, after the hours, the rite of confession of the faith of Abbot John was performed, during which he took the oath of allegiance and obedience to the Synod of Bishops of the ROCA. 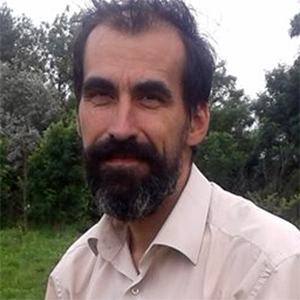 Bishop John of Melbourne will be the vicar bishop of the Chairman of the Synod of ROCA, Metropolitan Agafangel. 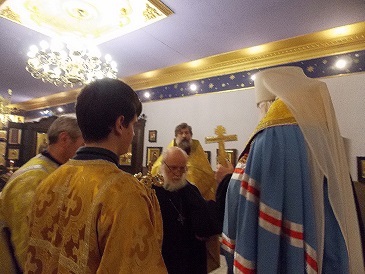 According to the Decree of the Council of Bishops, in the Odessa Archangel Michael Cathedral, at the completion of the All-Night Vigil and the hours, Metropolitan Agafangel and Archbishop George performed the rite of Election of a Bishop over Abbot John (Smelic), naming him Bishop-elect of the God-preserved city of Melbourne (Australia), to be vicar Bishop of the President of the Synod. 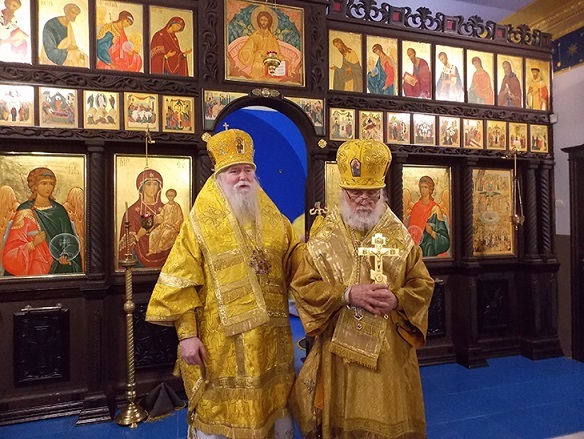 This appeal is made after discussion about the situation in our dioceses in America, Canada and the Russian Federation, having taken into account that retired Archbishops Andronik (formerly of Syracuse and St. Nicholas Monastery), and Sofrony (formerly of St. Petersburg and Northern Russian) have not recognized the Resolutions of the Ecclesiastical Court concerning them, and contrary to these Resolutions are continuing to conduct affairs as ruling Bishops . Archbishop Andronik, in his lawless ministry, together with Archbishop Sofrony, by false teaching and administrative actions continue to confuse the flock, which according to the canons, deserves the punishment of deprivation of the priesthood. We consider that they cunningly call for peace, yet are unwilling to negotiate with the hierarchy of ROCOR and refused to attend the Bishops Council. They are doing all they can to prevent reconciliation taking place in the bosom of the Holy Church, aiming to inflict division, based on their especially invented false heretical teaching. Having exhausted all possibilities for peace and reconciliation, the Council of Bishops of the Russian Orthodox Church Abroad has decided to leave them to the will of God, so that they themselves may decide their own fate. The Council of Bishops calls upon all people supporting archbishops Andronik and Sofrony to abandon their intention to organize an arbitrary gathering, calling it the “All-Diaspora Council”, and to dissolve the so-called “Pre-Council Committee”. Such a gathering convened without the blessing of the Synod of Bishops, in the case of it occurring, would be an act of schism and visible evidence of falling away from the Church. If this gathering is convened, all who wish to be present, testify that being warned, they have knowingly and willingly separated from the Church; which will be confirmed by the Council of Bishops by a decree prohibiting archbishops Andronik and Sofrony from serving, the prohibition from serving by their respective ruling bishop of all priests who take part in the unlawful gathering, and for all laity who participate - excommunication from Holy Communion; for which a special Conciliar Decree has been issued. The Council of Bishops calls archbishops Andronik and Sofrony, and all their supporting clergy and laity, to renounce the heretical false doctrine that the One Church of Christ presently does not visibly exist, but rather exists in the form of separated fragments, which have no communion between each other, to abandon this rebellion against lawful Church authority, and to rather begin preparations for a genuine and lawful all-Diaspora Council, consisting of all the Bishops, diocesan representatives, clergy, monastics and laity, through which only, according to Church faith, the will of God can be realized. A Letter to Victoria Sherba , parish choir director and lawyer in combination, from Sergei Savchenko parish warden and a lawyer , on her letter “Some thoughts of a parish choir director and a lawyer “, distributed on the internet. ROCA will not divide into two or more parts. ROCA is one, and will remain one. From Her may leave 2 bishops, 10 priests, and 200 lay people; but ROCA will remain one. Whilst the departed leaders of this schism will answer before Christ: what weighty blessed reasons they had for this step. Similarly those involved in their sin will answer before God for their immortal soul. Now let us consider the “severity of punishment.” (I am going on the content of your letter). Obviously the condemned bishops expressed unchristian non-humility, from the loss of 4 dioceses (by one three at once, by the other only one). Even so no one banned bishops Andronik and Sofrony from serving, nor expel led them from their rank, and so on. They were left with the right to serve only in their own parish and monastery respectively. Neither of them came to the Synod nor to the ecclesiastical court, which is in itself a call to ones’ brother colleagues. Furthermore, the opinion of Metropolitan Agafangel in this situation: punishment of leaving them in their ministry. The opinion of the members of the Synod is stricter: to ban, to expel. Mercy was victorious, it triumphs over judgment, and the Synod decided to leave them in their ministry, with a view to allow the peaceful resolution of further misunderstandings. However it seems the leaders of the schism specifically exacerbate the conflict. In this case, Metropolitan Agafangel is accused of intervening in “another’s” diocese of Archbishops Andronik and Sofrony. What about the insolentintervention of archbishops Andronik and Sofrony in the Diocese of New York and the East-America? Has Archbishop Andronik so little to do in the dioceses of Syracuse and St. Nicholas, Ottawa and North America, Australia and New Zealand? Or bishop Sofrony, being in the USA, having flown across the ocean, is deciding questions of the St. Petersburg and North-Russian diocese? Archbishops Sofrony and Andronik sin against the 34th apostolic canon, because they do not recognize the authority of the senior bishop, who they themselves have elected. Will the apostles really show favoritism at the Last Judgment, and approve the actions of the leaders of the schism Andronik and Sofrony, contrary to their rules, those established by the Holy Spirit? Then the holy apostles lied to the entire Orthodox Church for two thousand years, if their rules mean nothing for everlasting life. I think that the conscious violators of the holy God-inspired Canons, hope in vain for this. If the church rejects the apostolic canons, it is then not the Church of the Apostles. Victoria, if you sing the symbol of faith at each liturgy, then you know, that by their actions, archbishops Andronik and Sofrony reject the church dogma: “I believe … in the One, Holy, Catholic and Apostolic Church.” Pay attention to the doctrine of the unity of the Church. With whom are Christ and the apostles? With those who deliberately, persistently, cynically violate the canons; or with those who observe the canons, meekly bear their obedience, suffer slander, contempt, ridicule? I think neither you, nor I, have in the past year undergone so much blasphemy as our Metropolitan. Victoria, you write that at least two of our bishops may have possibly not been properly ordained and do not have apostolic succession. But did you know that since 2008 the apostolic succession of bishops Athanasius and John is from bishops Andronik and Sofrony, who read all the required prayers at the consecration of bishops at the cheirothesia of these individuals? Or do you question the sacraments performed by bishops Andronik and Sofrony in 2008! Victoria, blasphemy against the Holy Spirit shall not be forgiven Andronik and Sofrony. Do not participate in their sin. It may seem strange to you, but I am one of the few, who believe that there is grace in the Moscow Patriarchate as well! Since August 1995 however, I have never taken communion in the patriarchate, though I live in Ukraine next to their churches, I was forced to independently purchase premises, and arrange regular services. Happily the Lord has granted our true pastors to serve 58 Divine Liturgies, in the 16 years of existence of our house church. Why did I come from the MP to the ROCA? Due to violations by Metropolitan Sergius Stragorodsky, and automatically without exception by all his successors, of the 30th apostolic canon (If any bishop, or secular head, having used and through them, will receive episcopal authority in the Church, let him be deposed and excommunicated, and all those in communication with him, including lay people). This prohibition applies to all members of the Moscow Patriarchate, from the Patriarch to the layman. That is what is said there: “all communicating”. All these people are under judgment. All of them will be judged by Christ and the apostles: why did they not follow the new martyrs to the catacomb churches and to the cross, that which they took at the beginning of their ministry as Christians, clergy and arch pastors. At present, they are in canonical sin, and subject to judgment. Judgment is inevitable. 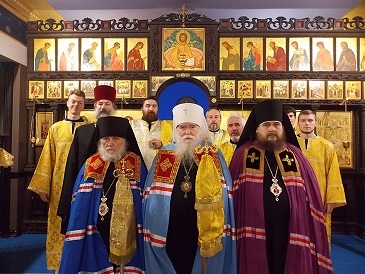 Their judgment will occur after their death, or if it be pleasing to God - at the upcoming Council of the Russian Church, at which Sergianism must be condemned as a pre-antichristian phenomenon of apostasy, which is detestable to God. The grace of the Holy Spirit will be to their condemnation. As the Holy Spirit is the Spirit of Truth. So by your logic, your future schism is a direct road to the Moscow Patriarchate, where most likely they are already awaiting you. The postulate of grace is in solidarity with the postulate of truth. 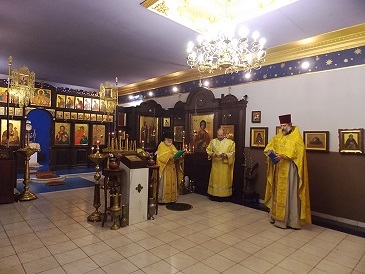 When you will worship God in the churches of the schismatics Andronik and Sofrony, will it truly be in Truth, or only in Spirit? Or are there two Truths in Christ? Perhaps nevertheless someone is wrong? Do not be fooled. You know that Metropolitan Agafangel and the ROCOR Synod is in the right. I think the next Council of Bishops will confirm this as well: whilst a bunch of detached people from the Church, who have organized a parasinagogue, are in the wrong. You write that not one of them preaches heresy or non-traditional teaching. Is not sin against the dogma of the unity of the Church not heresy for you? Or is violation of Apostolic Canons a tradition that was established in the church immediately after the Apostolic Council in the year of 51? By definition, this group will not be canonical. Is this ministry according to God’s will, being contrary to the canons of the apostles? Victoria, tell me the rules of canon law, which allows a few dioceses of the Church to dissociate themselves from Church fellowship with the other dioceses of the Church. Victoria, tell me the norm of canon law, according to which the role of the first bishop is reduced to the role of chairman at the councils? I think that it will be better for Catholics and Sergianists at the Day of Judgment, than for these people, who do not accept, rather banish their archbishop, do not listen to his words, but listen to false voices of wolves in sheep’s clothing. The ROCA is higher than the parasinagogue of bishops Andronik and Sofrony, like heaven is above hell. In a spiritual sense, the bishops, clergy and laity of the Moscow Patriarchate will be higher than all of you who will follow the leaders Andronik and Sofrony into schism. Because the blind patriarchal sergianists follow their leaders, who have not yet been condemned by the future Council of the Russian Church (the probability of which was believed by the pillars of ROCOR); whilst you are following those who have been condemned already! 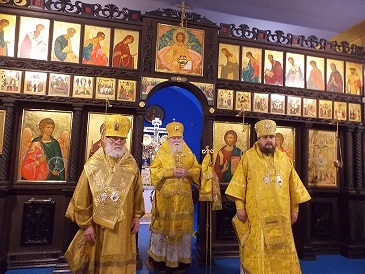 The Moscow Patriarchate leaders are under judgment by the Canons and dogma of the Church; but this judgment is not presently expressed individually to each sergianist, as almost none of them were judged as bishops Andronik and Sofrony. Your sin is even greater, by the fact that you have freedom of choice. Victoria, who is ridiculing who? On yourself and your brothers and sisters - can you wear all the mud and humiliation, which is spewed out of your group of activists? Who is ridiculing who? The victim here is the Church! She is being mocked by bishops Andronik, Sofrony and associates. Do you know that it all started by Metropolitan Agafangel interceding for the widow Dutikova, to whom was pointed the door? I personally corresponded on this subject with V.Yarmolinets. 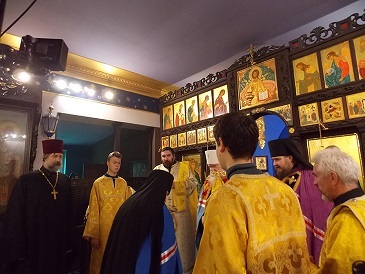 He acknowledged that the Astoria church council decided that 1 year after the death of Archpriest Vsevolod, Dutikova his widow, was to vacate the apartment (which will subsequently be rented out) and go to live with her children. They do not see any other way to improve the financial problems of the parish. It seems they have decided to sell the apartment. Since they do not hide on’ facebook ‘ that the profitability of this action would be counted in the hundreds of thousands of dollars ( pieces of silver). 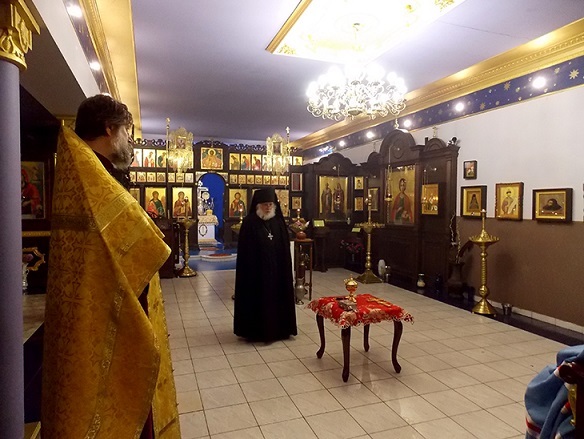 The spiritual atmosphere that has arisen in the church parish in Astoria, after the death of Father Vsevolod, can be clearly illustrated to you by the facebook page of the church council member Vadim Yarmolynts. I will tell you the basic principle of this page – not a word about God (except perhaps in swearing). Therefore I consider his ecclesiastical prohibition a logical consequence of his lack of proper spiritual Christian life. Is not the development of the image of the enemy (Satan) and the accompanying hate - a method of the Soviets ? Have you not read in the Gospel, that in the days of Christ many people left Him? Perhaps Christ should have adjusted His doctrine, so that no one would leave Him? Victoria, with whom are you? At the beginning of creation, God separated light from darkness (Gen. 1.4). In Hebrew it sounds literally as follows: “And God divided the sons of light and sons of darkness”. God acted like a tyrant? That there are children of darkness - who is guilty in your opinion? Perhaps it is not God, but rather the free will of those who choose against Him? “But there are some of you that believe not. For Jesus knew from the beginning who they were that believed not, and who should betray him. And he said, Therefore said I unto you, that no man can come unto me, except it were given unto him of my Father. From that time many of his disciples went back, and walked no more with Him. Then Jesus said unto the twelve, Will ye also go away? “. John 6.64-66. Also the rich young man who loved Christ, parted from Christ, etc. etc. There are numerous examples of disciples departing from the apostles. How can Christ and the apostles be blamed? However you dare to blame the Metropolitan - that he acted strictly, in relation to other members of the Church. Do all those who have departed from the Church to their own place, have the gift of the Holy Spirit in the fear of God? Victoria, for the sake of the salvation of your own soul, do not participate in the sin of destruction of the Russian Orthodox Church. You write that you have tried all options in avoiding a schism. It is surprising - do you yourself believe in what you write? From the side it looks quite the opposite. It is not BA/BS, as you call them, that travel to the Metropolitan for a resolution of the conflict, but on the contrary, the Metropolitan travels to the USA, personally recalls all his signatures from the prohibitions of Archbishop Andronik, but that one…changes his mind! Bishop Sofrony says to the Metropolitan that he needs to consult with someone to remain in the One Church. Consult with whom? We can only guess who those advisers (from the word soviet) are, and what cash money and certificates are in their pockets. Money, in denominations enough for the Archbishop of Northern Russia to leave the diocese in the Russian Federation, and live for months in the Americas. In addition, Archbishop Sofrony denounces himself, in confessing that he does not have his own opinion, and is subject to the opinions of other unknown persons. So this is your candidate for the future false-metropolitan! BA/BS preach heresy, because they teach that the Church can divide. This is a heresy – one type of ecumenism. It is simple. Will the church services of those who have been banned and stripped of their rank retain the sacrament of grace of the Holy Spirit? The answer is obvious - no, of course. “suffered mocking and scourging, and even chains and imprisonment: They were stoned, asunder, were tempted, died by the sword: they wandered about in the mantle and goat skins , destitute, afflicted, tormented; those whom the world was not worthy, wandering in deserts and mountains, and in dens and caves of the earth “(Hebrews 11. 36 -38). This is obviously similar to the spiritual state of delusion. The state of delusion, first of all, gives its victim insolence. And from insolence comes blasphemy and slander. Examine the book of St. Ignatius Brianchaninov “Ascetic experiences” in two volumes and “Otechnik”. They disclosed the spiritual state of BA / BS and those with them. meaning that the Catholic Church, allegedly, does not exist in visible form, and that She is divided into fragments. 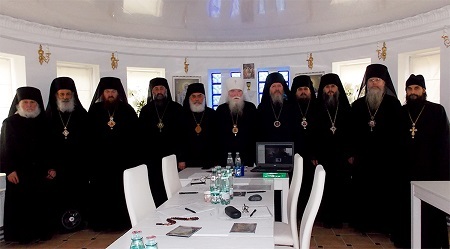 We believe that our Council of Bishops, chaired by Metropolitan Agafangel, as well as the dioceses, missions, monasteries and parishes subordinate to them, constitute a visible and “an inseparable part of the Local Russian Orthodox Church, temporarily self-governing on conciliar principles”. We conclude that to date there exist no objective physical obstacles to the canonical life of the unified Russian Church (the presence of a front line, closed state borders, open persecution of Orthodox Christians, etc.) and it is not “impossible to establish relations with the bishops of neighboring dioceses” (Decree №362, p.4). “the diocesan bishop immediately enters into relations with the bishops neighbouring dioceses for the organization of higher instance of ecclesiastical authority for several dioceses in similar conditions”. Since “ecclesiastical communion with the disobedient” (i.e, the “fragments”), is absent, we are with regret forced to state that the situation between us and the currently existing “fragments” is a state of schism. We, like the rest of the Church believe that the schismatics do not remain in the Church, but rather are parts now fallen away part of Her. At the same time, our Council of Bishops has always called, and continues to call everyone who previously was in the ROCA to lay aside attempts to justify divisions, which as we see, extend even to destructive and heretical false teachings. Rather, trusting in God, we call to restoration of our common unity. Let us arise in unity to do Thy work, O Lord, and faithfully serve Thee! May it be so!